Vinod Sreedhar is a maverick. He makes music, facilitates workshops and indulges in photography. He organizes learning visits to Ladakh, Srinagar and organic farms around India. His website www.signposts.co.in is dedicated to helping people grow self aware and practice earth friendly living. 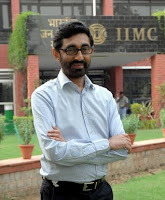 I chatted with him for an hour at IIM Bangalore during South Asia Youth Conference 2011. Few seconds into my conversation, I realize how loud I am speaking. I lower my volume bar in unison with his hushed voice, a steady sound wave curve that arises from his zen calmness. Even the caffeine seems powerless as he talks to me imperturbably, holding his cuppa, surrendered before his composed self. His low,placid voice, with his bearded looks reminds me of Suneet Tandon of DD News( Remember the good ol' 90s?? ), who updated us with the happenings of the world with poise before the world turned flat and our television sets became noisier. Venky: Take us through your your early days. Vinod: Lived a fairly conventional life till the age of 25 in Bombay. Did the usual things, school, college and all that. At the age of 25, I got interested in working with an NGO. I joined Association of Youth for a better India. There we started working on civic issues mostly, related to Waste management. I met a couple of other people there, who exposed me to various ideas. It all began with Masanobu Fukuoka’s One Straw Revolution. The other good book which deeply influenced me was Ishmael by Daniel Quinn. It’s a fiction novel about how civilization got to where we are today. That was an eye-opening book for me. Starting there, I read a lot more about ecology and systems thinking. I realized that there are whole bunch of things going on, which I had absolutely no clue about. It wasn't just me. It seemed the entire civilization was largely unaware of it. We seem to be operating on a set of assumptions about how the world operates. As I began reading further, It looked like a completely new world view for me. I started meeting several people who opted to walk out from the existing mainstream society in some ways consciously. They made these conscious choices about how to live their life based on the new thinking that they developed, and I wanted to do the same. I was 25 then. It’s been 11 years of journey, constantly trying to understand more and trying to make a shift, a more permanent one. I don’t know what shape it will take later, but that’s the way it is. Venky: You said you started off with an NGO. You were never interested in a conventional job? Vinod: I was always very uncomfortable with a job. I never held a job in my life. I walked out of college during my 3rd Year B.Com. I am not a graduate. I realized I wanted to be a music composer. I was playing with a Rock Band and I started composing music . That was the time AR Rahman had started becoming very popular, I figured one could make a living out of this. I started making music for jingles, TV serials. I never had this fascination for working in a job somewhere. This gave me a lot of freedom to travel and do stuff that I enjoy and I was making good amount of money doing that. Venky: So dropping out of the college was more of a music thing??? Vinod: Even music became quite shallow. Although I was doing creative stuff, at the end of the day, there were all these sick things that one had to do to get business. You would be playing lot of manipulative games with the clients and they would also be doing same back with you. I wasn't enjoying that at all. I began to reduce my time for music and started looking for opportunities. I met a group of friends and we started a social organization called Phase V.
Vinod: The term came from what we were reading about in Ishmael. We initially called it After School. We thought true education starts after school. In school, you are taught a huge lie about civilization and how it all originated. It's done in a very unconscious way, as even the teachers don’t know that they are teaching others a lie! Ishmael talks broadly about 4 phases of development across the history of mankind. 1) Prehistoric Men and women 2) Tribal society 3) Monarchy 4) Nation state. That led us to the obvious question: Does this have to be the final one? What about Phase V? The word stuck with us. It was not just the name of the organization, but an ideal. We started doing workshops around Systems thinking. The basic premise was: We need to look within ourselves. We need to have much better perspective of who we are, in connection with ourselves, others, and the environment. These were the three main areas we were looking at. Each of them had its own template. For instance, connection with ourselves had to do with identity. We would look at our own identity. What sort of identity we chose to take up? How did it impact our life? It led us to the next step:How does it impact the way you would look at other people? It led us to democracy and other political structures which defined the way we relate to each other. And finally, Ecology. How do we relate to the environment? We were looking at how to live life and how to connect all these disparate elements in life and try and make some sense of it. 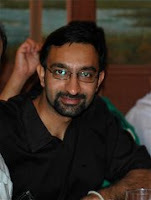 Venky: When you talk about relating with each other, in a country like India, where we are intricately connected with our family members and a network of relationships, unlike an individualist society like US where its easy to walk out without any baggage, how could someone, who is passionate about this, really make others understand this world view? How did you face that? Vinod: When we talk about such things, people don’t understand where you are coming from. Because they operate from a certain paradigm/framework. Its just that their parents also followed that and their (parents') parents also followed, and nobody questioned anything. It took me a few years of conversations with my family members, friends, and brother. I had to keep engaging with them continuously. Initially, it took the form of rebellion, fighting, arguments etc. I didn't have a way of articulating all these things to myself. I couldn't explain it to them. When you are talking about something like systems thinking, it has millions of elements in it. To be able to form of some sort of coherent frame work to make them understand,took me few years of reading, doing and working. Finally I managed to do that. Now, its not a problem anymore. Also they have an expectation of you working somewhere, taking up a job, getting married and buying a house etc. I wasn't interested in doing that. I didn't have any aspiration to buy a house in the city, which I always found quite absurd that we would end up paying 70 -80 lakhs($7-8 million) for 1000 square feet match box apartment in the city, when one could go live off the land somewhere for a fraction of that amount. Why would you want to live with power-cuts inside a little match box inside a polluted city? They didn't really get it. Once I started explaining the ecological aspect of it, what sort of impact our lifestyle has on the environment, they started to understand a little more. It's interesting to see how these things compel us to go in certain directions. Like if I have to buy house in the city, if I needed that kind of money, I would have to take up a job which would pay me certain amounts of money. It's not necessary that the job I love doing would pay me that much. I might have to do something that I don’t enjoy. For some distant reason that I don’t believe in, I would be paying EMI for 30 years, just to live inside a matchbox. Why can’t I just go and buy an acre of land, far away from the city, which is much more affordable and healthy, and then build my house there and grow my own food? In Ishmael, Daniel Quinn says that the whole purpose of why you live is, apart from the spiritual side of things, in a physical way, is to eat food. Instead of going through 12 years of school, four years of college, specializing in something, and taking up a job which keeps you in for 10 or 12 hours a day, in order to buy food which you can eat, why don’t you just grow and eat it? It’s a direct thing. You go out, plant food and eat it. That made so much sense to me. I didn't really want to go through that whole process. I found this very appealing. When I started explaining this to my parents, they began to understand. So did my friends and family. After a while, it was much easier. Now I receive much support from them. While they don’t understand my motivations, they have understood my rationale. They do ask me: Don’t you worry about money? You don’t have a house in the city. Who will marry you? They are not hostile towards the idea anymore. They don’t think I am a moron for doing this. You may want to check Part-II- Part III of the interview!